Silvia is a doctoral candidate in the Department of History at Florida International University. His dissertation is titled "Making Haiti Modern: Nation Building and the American Civilizing Mission in the Cold War Era." Silvia is also the creator of An Island Luminous. 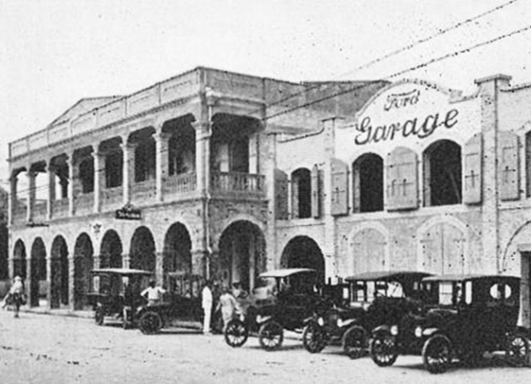 The automobile arrived in Haiti between 1912 and 1913. Most were American models, Buicks and Fords, imported by a wealthy merchant family, the Mevs. Those with money were welcome to purchase a vehicle. Or they could rent one at the Compagnie des Automobiles de la Ville de Port-au-Prince. Initially, however, there was only one gas station in the entire country. And it was owned by the Mevs. An astute businessman, Louis Mevs knew how to sell a car. "Go anywhere on any terrain," he promised. "Made especially for bad roads." When Louis Mevs said that his Fords were "driven in cities all over the world," he told the truth. Ford Motor Company sold vehicles on every inhabited continent. In Latin America, it sent representatives to meet with local businessmen, who purchased the Model A and other vehicles which were then resold. As historian Mira Wilkins once put it, "the sun never sets" on the Ford Motor Company. As adored as they were by Haiti’s urban elite, automobiles created new problems. With the car came the car accident. In his multi-volume work, Port-au-Prince au cours des ans, historian Georges Corvington explained that "most accidents were caused by careless drivers. But some were caused by unavoidable circumstances. Whenever a fast car startled a horse and buggy, there was an accident." This is why in 1912 the state imposed Haiti’s first speed limit: twelve miles per hour. While automobiles were seen by some as a symbol of advancement, others were not so sure. 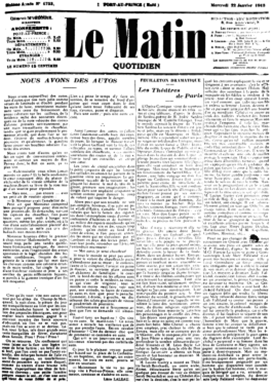 In Haiti’s daily newspaper, Le Matin, a well known intellectual, Léon Laleau, noted how the streets now smelled like a factory. "We now have cars," he proclaimed, "so many cars that our streets, which were once weary and forgotten in the moonlit hours of the night, now echo constantly as tires bump over stones" and "nervous drivers" honk their horns. Laleau observed how the automobile inspired "snobbery" and jealousy. "The love of the automobile," he explained, "widens one’s eyes" and "stirs one’s soul." "When someone walks by Geffrard Square and sees the line of vehicles at rest, and sees the drivers, these masters of the road, all very pleased, his envy burns in his heart." The car was a status symbol. And only a small minority had the money to purchase one. Unlike in the United States where Ford’s moderately priced Model T became a symbol of democracy, in Haiti, a Ford indicated wealth and epitomized inequality.